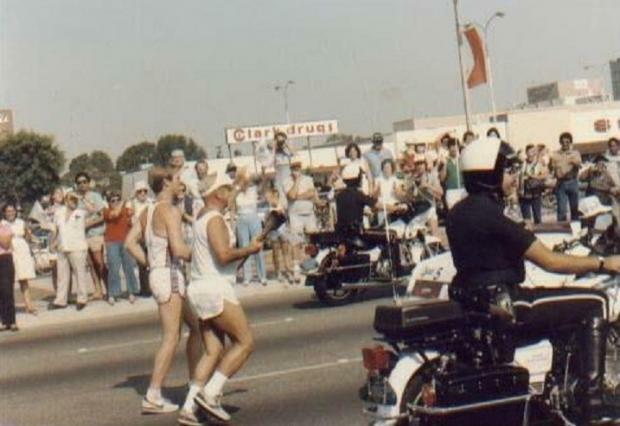 The 1984 Summer Olympics: The opening parade for The Los Angeles Games came down Hawthorne Blvd. The Olympic Torch Relay was sponsored by AT&T, and was the very first to charge runners to participate, with fees of around $3K per kilometer (both decisions made by the L.A. Olympic Committee). But all $11 million raised by the relay went to kids' athletics charities. The relay was meant to be egalitarian, and any runner who could raise the money—through bake sales or whatnot—could run, and did. Children, moms, firemen, amateur-class runners, even Bruce Jenner and O.J.Simpson: more than 6,000 individuals carried the torch across 33 states on a 15,000 kilometer route.